When Kimberly Mueller arrived 15 weeks early weighing just 10oz’s doctors gave her a one in a thousand chance of survival. After the delivery, the baby was wrapped in plastic and whisked away while the team of doctors worked on her. She spent 6 months in the hospital and has now been given the okay to go home with her parents. “Babies as small as this usually have no chance,” said Dr Oliver Moeller, a heart specialist who treated her. Kimberly is the smallest baby ever born in Germany and the youngest to survive. She was just 10.2 inches long and weighed little more than a packet of butter when she arrived in the 25th week of her mother’s pregnancy. Petra Mueller, 38, who remained at her daughter’s bedside in intensive care at the University Clinic in Goettingen, was allowed only to stroke her with her finger. “It was the nicest thing when she would grip my finger in her tiny hands,” she recalled. Kimberly was placed in an incubator for warmth, given a respirator to help her breathe and fed through a drip. She was also given a cocktail of drugs to boost an immune system that was barely formed. At three months, she faced a major setback, when doctors feared she could be blind. But laser treatment corrected the problem. Kimberly’s progress was underlined when she arrived home this week weighing five and a half pounds and measuring 17 inches. During the coming weeks she will continue to be fed artificially and will need to have oxygen as her lungs keep developing. The world’s smallest known surviving baby was Rumaisa Rahman who weighed just 8.6 ounces when she was born in Chicago in 2004. 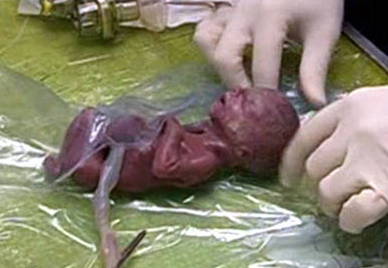 Last year Amillia Taylor survived birth at 22 weeks weighing 10ozs. Today she is a healthy plump baby that is doing well and thriving. I believe that the support that their parents give them and the time they spend at the hospital makes a world of difference. What a little miracle for sure. Would love to see pictures of her today. My granddaughter is 8 now, and was 13 weeks early and was about twice this little ones size.